BEFORE I ANSWER MY TAG, LET ME REMIND EVERYONE TO WATCH FOR MY GRANDSONS IN THE PASEDENA ROSE PARADE TOMORROW. THEY ARE WITH THE BROKEN ARROW OKLAHOMA PRIDE BAND. MY GRANDSON RYAN WILL BE EASY TO SPOT BECAUSE HE IS ON THE LAST ROW WITH THE BIGGEST DRUM. DILLON IS FOUR ROWS UP ON A BARITONE BUT WILL BE DIFFICULT TO PICK OUT. WE ARE VERY, VERY EXCITED!!!!!! I was tagged by Riot Kitty who says F_ _ _ _ a lot, and I’ve always admired a woman wo can say F _ _ _ _ with confidence. (Just don't confuse me with being a radical liberal like RK. I am a moderate who agrees to disagree.) Oops, is that a random thing? 1.) I was a bootlegger when I was 19 years old. 2.) Over a 26 year period I attended NINE colleges to receive an associate degree, a bachelor’s equivelant and one semester of graduate school. This leaves too many teams to root for during football and basketball season. 3.) I have been a Methodist since the day I was born. 5.) I could be guilty of loving my spouse way too much. 6.) I cannot explain God but I am positive She exists. Click to enlarge sunrise photo take from my kitchen window. Have I got a view or what? Kenju says, "memes are good for when your brain is mush, right?" So I took this from her here, which she got here, because it was linked to from here! Those in bold are things I have done. 14. Taught myself an art from scratch. 18. Grown my own vegetables. 23. Taken a sick day when you're not ill.
75. Been fired from a job . How many have you done? Feel free to steal this and do your own. 2009 approaches and all is well on NOL-NOC Estates. The lovely graphic above is from a raggedy quilt my sil Elaine made me for my 60th birthday. NOL-NOC stands for "No One's Looking -- No One Cares", cause on this farm we don't put on airs. Yesterday we traveled to my daughters for another Christmas celebration. The meal and fellowship with family was wonderful and, as an added bonus we got to bring our 14 year old grandson Michael home with us. Perhaps his parents had an ulterior motive in sending him. They also sent his new electric guitar that Santa brought him. Hum??? I'll try to keep up my reading but have a feeling Michael will occupy my computer until next year so I probably won't post until 2009. Michael is ready to bring in New Year with his homemade spud shooter that ignites with hairspray and sounds like a sonic boom. Daughter's lovely family minus dogs Anna and Heidi and cats Pinky and Simon. Oh, and new robot dog named Biscuit. Proud grandparents with the fam. Son-in-law taking photo. Daughter waves farewell to Christmas 2008. Terri, our oldest in San Diego, sent her oldest off to college this year. Oh my gosh, we have a grandson in college!!! Chelle, our Missouri daughter, will be moving her family to Oklahoma. Her husband got the job he applied for and it will be wonderful for them to be Okies! We hope he will get to see his family more with his new job! Jessi, my goddaughter in LA managed to surface from her auto accident unscathed and got word that she also survived the COST, as the Lexus driver settled for what her insurance would pay. The money was a big deal to her but the fact that she was not injured was the big deal to the rest of us. We were glad she had Joe there to help her through all the trails and tribulations and need for transportation! Travis, my godson, took Christiane on a hike this year and managed to propose on a mountain top without any help from us. (He's the one who couldn't order his own hamburgers at McDonalds.) He had her engagement ring custom made and he kept the whole thing secret until the deed was done. We all love her so and are excited for them. They will be married July 4, 2009 in Germany. If the weather permits, we might have another Christmas celebration tomorrow. We have been invited for lunch at Chelle's tomorrow in Missouri and I can't wait. I hope everyone read ILYB yesterday with this post by Cliff. Remember to check it every day for something new. Oh yes, Ron won enough at the Casino yesterday to recoup all our costs of the day! Blessings and love to all tomorrow who gather at a table to feast on Christmas memories and establish new traditions that will blend with the old. We have been together ten years and today marks our 9th anniversary of marriage. Entry from 2005 tells the story on post titled THIS DAY. We're taking the day off and heading for the Casino. Since we had such luck with the marriage and the pearl, who knows what might happen next. People ask us often how long we've been married and when we ask them to guess, they usually guess over 40 years. My sister gave us this lovely little ice skating scene. It was fun to open and fun to set up (at least for Ron who watched Sis and I put it together). The skaters are placed above magnets, the scene is plugged in, music plays, lights go on and the skaters begin to move around the frozen pond. It is delightful. Sis brought one for Bro too. We set mine up so he and sil could see what it was and not have to open theirs until they got home. This morning Bro called Sis. He told her that he now knows what it's like to get coal in his stocking. The box was empty! It seems Sis had purchased the last two skating scenes in the store and one was the display. She purchased and wrapped an empty box for our brother. Now they are even. Why? Several years ago my brother and sil ordered family photos for their Christmas cards. When they received their order they found a family card included of complete strangers. The card was accidentally placed in their order. They sent it to my sis and bil with a note about remembering all the good times and telling them they would see them in the New Year. Sis and bil had no idea who these people were and they frantically tried to remember, asking everyone if they knew the strange family. Finally bro confessed. Now you know why they are even. Just don't ask anyone about April Fools Day! Left to right, Bro, Sil, Me, Sis, Bil, Cuz, Son, Grandkids on front row. Nephew visits NOL-NOC Estates for the first time! Joy To The World! Cuz from Georgia shares wonderful Christmas with family. Ma with no kerchief and Pa with no cap but finally the old folks might get a nap! Christmas comes when invited. As my children were growing up and they shared Christmas between my home and their dad's, I learned that December 25th is not the only day to feel the spirit of Yuletide. Yesterday we not only celebrated with family, we heard from all the rest via mail, email and telephone. Hope your celebrations are as grand as ours was yesterday. Click on my graphic on the sidebar titled "I Love Your Blog" to see what I think is especially unusual, interesting, clever or funny. You will find a post that captured my attention. I will try to change it every day. While I don't have time to post right now, I do try to take a few minutes to keep my reading up. Today it might be your blog post or maybe yours will be tomorrow. We were ready for bed when Slim sounded the alarm. I let her out and heard the squawking ruckus in the hen house. Ron grabbed his gun and I grabbed the flashlight. I held the flash light on our prey while Ron blasted it to kingdom come. No chickens were harmed in the making of this blog post. We are a well oiled team of three -- Annie Oakley, Doc Holiday and Rin Tin Tin. Anyone voting for Barack Obama for President (which I did not as you well know but who I support as elected President ) knew that he was a smoker. It did not seem to be a big deal. Now he says he won’t smoke in the White House. Who cares? He will be President of The United States and smoking is legal and it is the privacy of his own home. I do not smoke but I used to. Four days on morphine in the hospital after my heart attack cured me. I mean it really totally completely cured me. I walked out of the hospital not desiring to smoke and the desire has not returned. It was a Mackerel! However, prior to this major and miraculous event I had tried to stop smoking on my own and failed each time. While I was trying to stop I turned into the meanest and most confused soul on earth. Personally I do not want the President struggling to solve major world issues and concentrating on the need for his nicotine at the same time. Can he put Russia or China or Korea or Iran on hold on the red telephone as he heads outside for a puff or two? Now the media will stalk him trying to catch him with a smoke. It will be front page on the tabloids. We will probably treat him worse over that tobacco than we did Clinton and his cigar! 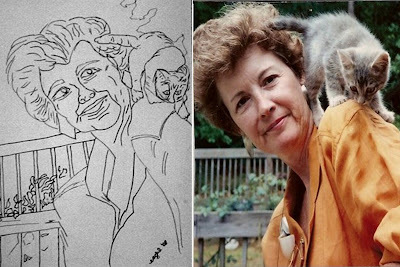 The December "Color Me Who" contest picture was of Kenju (Judy) of the Blog Imagine from a picture posted October 21, 2008. Be sure and read her blog if you haven't and thank her for being a good sport by allowing me to use my drawing of her. The December "Color Me Who" contest winner is: Jamie Dawn of Jamie Dawn's Mindless Blather. JD, you have won an Eaghl Markering of a picture of your choice. I know millions will want to congregate on your blog to congratulate you. 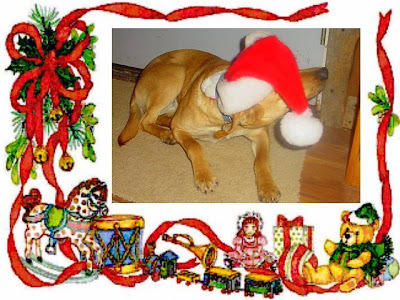 The participants in this contest for December were: Jamie Dawn, Mary, Linda, Brian, Marla and Nancy (kind of). Nancy guessed who the picture was of but failed to name the blog name and the date. Her answer was a typical Nancy answer, she simply emailed me " Judy, Judy, Judy". Visit these participants and get to know them. Start sharpening your pencils for the January contest and thanks again for playing along. My sister, Elenore, has always been obsessed with grooming. A woman of style, she rarely allows herself to be seen without make-up, nice outfit, great hair. If she is reading this she's shaking her head and saying "Not true" but believe me, it's true. Elenore was constantly getting after our mother to put on lipstick. Mother would do so reluctantly but we all loved the result because adding a little color to mother's face seemed to make her natural beauty pop. Yesterday my sister and bil were returning home from a weekend at their cabin. We had talked on the phone and Elenore had bragged about sitting around in her pajamas the entire time. I was glad she could relax because their home is grand central station where even strangers show up unannounced and are welcomed in. We had a brief visit while their dog Tikka ran and played with dog-cousin Slim. It is nice to be on Sis's path of travel when they have been to their cabin. We always have a fresh pot of coffee ready if we know they are coming. This morning I noticed Elenore's coffee cup from the day before still on my kitchen counter. On the rim was a little lipstick imprint. I laughed because I could just see her right before they entered our house, adjusting their rear view mirror and slapping on some color! Okay my friends, remember you still have until 5:00 PM CST today to enter the December "Color Me Who?" contest. Yesterday I posted the final clue for the December "Color Me Who?" Contest. You now have the weekend to search and post your answers before 5:00 PM CST on Monday Dec. 8, 2008. Click on the December contest graphic on the sidebar to be reminded of the contest rules. When you find this blogger and the photo in question, take a minute to read her blog. You are gonna love her. FIRST CLUE: This blogger has had over 108,000 visitors to her blog and she has 134 bloggers on her friends list. SECOND CLUE: You can find this blogger in North Carolina surrounded by flowers. THIRD CLUE: The picture this was drawn from is in one of the blogger’s October posts. FINAL CLUE: You will find the contest blog between my 25th and 27th name on Blogger Buddies list. Can you Imagine? Remember to tell me in the comment section that you are going to send your guess in an email so I can be watching for your answer in case it accidentally goes into my spam. For a delightful and touching story, go to my cousin's blog and read about The Butterfly And Mother. For some great information about Affiliate Marketing Scams go to General Information blog and read THIS POST. My physical therapy for my shoulder has been great. It has not taken long for PT to give me relief from the accident that took place on July 7, 2008. My pain could have been alleviated much sooner if only my skills had been good enough to get past the doctor's bully nurse. Next I had to get x-rays, MRI and referrals ot specialists from insurance. What has been the biggest problem with two days a week of PT? Not the exercises. They have been great and helped so much. The problem has been having to be somewhere at a certain time on such a regular basis. That has been too much like going to work. My days in the workplace of Corporate USA ended in June, 2000. At first I actually missed being gainfully employed. How do you miss getting dressed up five days a week and trudging off to your 9-5? It was a habit. I was a robot of routine. Now my routine is whatever. The animals (spouse included) are fairly demanding about their meals but even they will wait for me to get moving. We believe we are secure for the future, but if worse would come to worse, would my memory serve me well enough to return to banking? And do you think they would let me wear jeans and loose flannel shirts to work and keep a box of baby chicks under my desk? Okay my friends, today is the final clue for the December "Color Me Who?" Contest. You will find the contest blog between my 25th and 27th name on Blogger Buddies list. Can you Imagine? You now have the weekend to search and post your answers before 5:00 PM CST on Monday Dec. 8, 2008. Click on the contest graphic on the sidebar to be reminded of the contest rules and to see all of the clues. When you find this blogger and the photo in question, take a minute to read her blog. You are gonna love her. IS FIFTY THE SEASON FINALE? We have enjoyed the totally insane TV show BOSTON LEGAL and this is the final season. It seems they are dropping the bar as they bring this to a close. However on Sunday evening they hit a home run as they used 85 year old Betty White’s character to raise an interesting fact about television programming. The largest group of television viewers are over 50 but the majority of the programs are geared for younger people. According to the BOSTON LEGAL storyline that is because younger folks need reality TV that doesn’t require a lot of concentration and they can play on their cell phones, game boys, and ipods, etc., while a program is on. Assuming this information from a TV show is true, why wouldn't the producers of television shows try to appeal to their largest audience? Why aren't advertisers of products for the 50+ raising questions? I knew there wasn’t much on Network TV that appealed to me but I didn’t think of it as age discrimination. Tell me if you are in age group 20-30 or 30-40, 40-50, 50 plus and let's hear what your favorite programs are on NBC, CBS, PBS Fox and ABC. December “Color Me Who” contest clue for today is: The picture this was drawn from is in one of the blogger’s October posts. To catch up, all the clues and the contest rules are listed on the sidebar under the contest markering. My grandfather put me on a bus when I was twelve to send me home. He was very nervous about his granddaughter traveling alone but the bus was only stopping in small towns and I promised to remain in my seat on the bus. I also promised not to speak to strangers. From my window seat I was waving at Grandfather feeling a bit sad to leave my grandparent’s home after a week of being spoiled. As I was waving a look of terror come across my grandfather’s face. I turned to see a handsome sailor taking the seat next to me. Needless to say, I smiled but Grandfather started moving toward the bus door as the bus started moving out of the station leaving my dear helpless grandfather staring at our dust. That nice sailor talked to me telling many interesting stories, was very polite and I fell in love that day. High school yielded many trips with various organizations and my mother always chaperoned. There was an annual FHA (Future Homemakers of America) trip that kept us overnight and we got to stay in a big city hotel. There was a Navy training station nearby and it seems the hotel was always teeming with handsome sailors. My mother would sit outside our hotel door in the hallway with her umbrella. She planned to use that to fight off the sailors. If we had been allowed a choice we would have been sneaking out or sneaking those guys in our room like crazy. By the way, have you met Khia? You should go HERE to get acquainted with this magnificent fellow. Today’s contest clue: You can find this blogger in North Carolina surrounded by flowers. My tooth blew up on Sunday night. What is a person to do? This person is fortunate to have a BIL (Brother-In-Law) who is a Dentist. And, not just any Dentist -- he is the world's greatest dentist! Monday morning I was in his office (one hour away) before he opened his doors. My sister was helping in the office yesterday which is not always a good thing. When she assists chair side she tends to place the suction thingy in my ear or nose. I certainly hope she doesn't do that to other patients! It turned out to be quite a morning and my sister joined me in my travels from BIL's office to his Endodontist friend to learn of pending root canal and back to BIL's office for filling in decayed tooth.. If there are two people who should not be left unattended my sister and I would be those two. We were off to reek havoc over three states, Oklahoma, Kansas and Missouri, and people felt safe in their homes never knowing what was unleashed near them. I can't think of a better way to close out the holidays than having your dental health cared for by the best and then getting to run amok with your craziest friend sister. Thanks you guys!!! Okay, here is the first clue on the December "Color Me Who?" Contest. This blogger has had over 108,000 visitors to her blog and she has 134 bloggers on her friends list. Your name will be entered in the drawing five times if you guess correctly without any clues, four times if you guess correctly after first clue, then three after second, two after third and one after final. Tell me in the comment section that you are going to enter a guess then email your guess rather than post it in the comments. The winner of the contest will receive an Eaghl Markering coloring page of a photo of their choice. The chance to guess ends December 8, 2008. I have permission of the blogger to use this image from their blog.